Once again this March, the Friends of Vermilion River Watershed will host a free, open house event at the Historic Vermilion-on-the-Lake Clubhouse. It is the tenth annual such event. 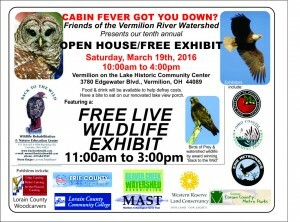 Please mark your calendars for Saturday, March 19 any time from 10am-4pm to stop out and browse nature- and watershed awareness-oriented exhibits. One of the major attractions is a wildlife exhibit created by the Back to the Wild wildlife rehabilitation center of Castalia. They will bring live wildlife for exhibit and educational purposes. Usually, some type of wildlife that has been rehabilitated will be released during the afternoon. Col. Nahorn will also again be attending and exhibiting, representing the Beaver Creek Watershed Protection Group (an affiliate group of the New Indian Ridge Museum, focusing on watershed awareness and low-impact development within the Watershed) and also West River Paddle Sports, where he serves as a naturalist and tour guide. Please plan to attend. This will be a fun and informative event, as always.